Mercedes is using autonomous driving features in the latest series of S Class cars as part of the wider digitisation of the company’s Sindelfingen plant. Mercedes-Benz is entering a new dimension of motoring with its new S-Class and is raising the bar, in terms of production, for the automotive industry worldwide. For the official start-up of the luxury saloon in the Mercedes-Benz plant Sindelfingen, an S 560 4MATIC in obsidian black metallic drove independently off the final assembly line, without a driver at the wheel. The vehicle then drove automatically approximately 1.5 kilometres to the loading area within the plant. In order to ensure that the car reaches its destination reliably, newly developed and patented technology is used. Cameras, together with radar and ultrasonic sensors work in conjunction with powerful software to accelerate and brake the S-Class independently and ensure that it stays reliably on track. “The new Mercedes-Benz S-Class sets worldwide standards for safety, comfort and connectivity and is on the road to automated driving. The S-Class’s independent journey from the production line to the plant’s loading area shows the future of how we will be able to use driver assistance systems in production.” We are taking the next step in the digitalisation of our complete value-added chain. We are systematically applying Industry 4.0 in all areas from development and production through to the customer. Perhaps in the not too distant future, a Mercedes-Benz will even find its own way from the production line to its new owner,” says Markus Schäfer, Member of the Divisional Board of Mercedes-Benz Cars, Production and Supply Chain. Now that the technical prerequisites for automated driving from the assembly line to the loading area have been put in place, the Sindelfingen plant is currently piloting the possible use of the system for series production and investigating its further potential. The finished vehicles are currently driven from the assembly halls to the loading car parks by members of staff. A shuttle service then brings the employees back to their starting point. The pilot test provides an opportunity to gather practical experience for the future of “autonomous driving” on public roads, which can be used for further development. 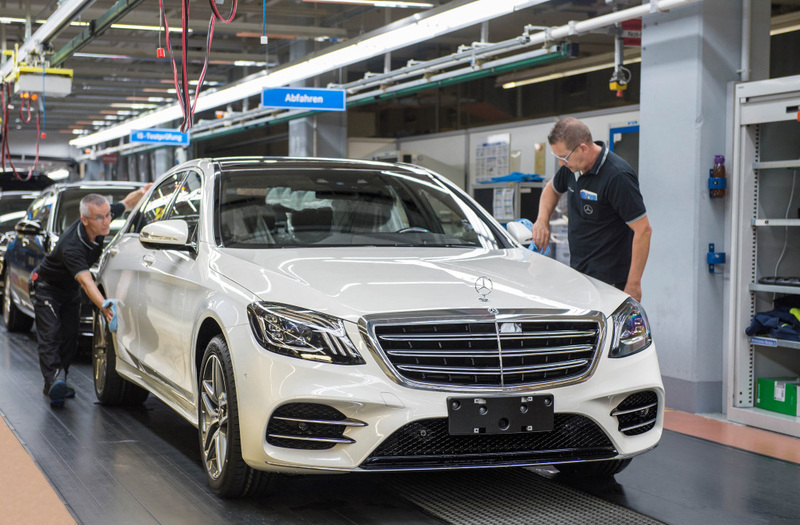 The start of production for the new and fundamentally updated S-Class brings the introduction of state-of-the-art manufacturing processes and cutting-edge Industry 4.0 methods in the assembly area. “Within our global production network, the Mercedes-Benz plant in Sindelfingen is the centre of competence for upper-range and luxury-class vehicles. Within the production of the new S-Class, we combine the advantages of Industry 4.0 methods with the expertise and cognitive skills of our employees. The manufacturing of a perfect Mercedes-Benz S-Class depends on high-tech methods, but most importantly, upon the commitment and passion of our employees. We see evidence of that every day here in Sindelfingen,” says Michael Bauer, site manager and head of production at the Mercedes-Benz plant Sindelfingen. * State-of-the-art data transmission and the very latest hardware provide staff with the information they need about the specifications of each individual vehicle. Additional mobile devices such as tablets, mini PCs and smart PDAs support the employees during each step of the work process. * An innovative tracking system detects vehicles in a virtual image of the factory in real time. Mounted transmitters can accurately identify the position of the vehicles on the assembly line and can exchange data with devices such as wireless Wi-Fi screwdrivers. This enables for example the electronic documentation of data, such as the torque, for quality assurance. * The flexible delivery of small-load carriers to the production line is ensured by a system known as FLOW (Flexible Logistics Optimised Warehouse). This new driverless picking system provides the supply of materials to the production line as and when they are needed. The whole system is currently part of a pilot test that aims to validate the system for series production for the new S-Class. The small-load carriers are transported autonomously around the shop floor via a guidance system with reference magnets embedded in the hall floor and can be automatically allocated to any specific storage shelf. Safety is paramount at all times: the driverless picking system is equipped with laser scanners for safety, which prevent potential collisions. * The delivery of components for the interior and engine compartment demands lean and efficient processes. More than 500 different items must be delivered punctually to the assembly line. The filling of the so-called ‘shopping basket’ represents the interface to the logistics area. It is pre-selected with all necessary parts and components required to fulfil the specific customer order and then delivered directly and completely automatically to the line, negating the need to keep materials stored on shelves. This creates more space around the assembly lines, reduces walking distances and keeps the workstations tidier and more ergonomic for the workforce. Whether the specific model is a Saloon with long or short wheelbases, a Mercedes-Maybach or a Coupé or Cabriolet: all variants of this luxury car are produced on one line. * VaMoS (Variables Montagesystem, or Variable Assembly System) is a new, variable assembly system. VaMoS is comprised of mobile platforms which are synchronised with the production line to carry a worker and his or her tools alongside the vehicle being produced. The technology, developed by Daimler, is not only responsible for improving the ergonomics of the task, but can also reduce manufacturing time and the time spent by the worker to get from one job to the next. * A recent addition helping to improve the ergonomics for the workforce working on the S-Class production line is the so-called ErgoSkid. This fully automatic device raises the vehicles on the assembly line by 26 centimetres and then lowers them again. Employees working on the installation of the cable harnesses for the floor assembly are able to benefit from this ergonomic improvement. The ErgoSkid is used exclusively in Mercedes-Benz production facilities around the world. * In the S-Class production line the automatic assembly of  seal plugs is currently tested: an intelligent lightweight robot takes on the task of inserting the plugs in the underbody. Until now this was completed bystaff having to perform overhead work on the vehicle. In the future, this robotic solution will be used in the production line for a range of Mercedes-Benz models and will thus make things easier for the workforce. With the introduction of state-of-the-art Industry 4.0 methods, digitalisation begins to become tangible for customers, too: a new function within “Mercedes me” makes it possible to order the desired vehicle from the retailer and to track its production status online from the comfort of your own home or while travelling. Between the ordering process and the delivery, Mercedes-Benz offers buyers of new cars exclusive insights into the production of their Mercedes-Benz passenger car at various production stages – from being scheduled into production, through to the bodyshop, the paintshop, assembly, quality control and all the way to final completion and planned delivery. The TecFactory in Sindelfingen, in which Mercedes-Benz has intelligently networked its Design, Development, Sales & Marketing, Purchasing and Production divisions, enables the company to continue to play a leading role in terms of both products and production technology. The various disciplines work together from a very early stage of the product development process. Digitalisation plays a vital role across the board, creating the foundation for a highly flexible production system and the increasing individualisation of vehicles in line with customers’ requirements. The new S-Class, which celebrated its world premiere in the middle of April at the Auto Shanghai motor show, and will be launched in Europe from the middle of July onwards, represents the automotive benchmark for efficiency and comfort. One of its highlights is an all-new and highly efficient engine range with a series of new technologies for electrification of the powertrain. “Intelligent Drive” takes another step towards autonomous driving. And the unchallenged leader in the premium segment sets new standards in the interior with regard to comfort and wellness. Several new engines are planned for the new S-Class: in-line six cylinders as diesel and petrol engines as well as a new V8 biturbo petrol engine. In addition, Mercedes-Benz plans a plug-in hybrid with an electric range of about 50 kilometres. At the same time, ground-breaking technologies such as the 48-volt Integrated Starter Generator (ISG) and the electric booster compressor (eZV) celebrate their world premiere. The top-of-the-range model takes another big step towards autonomous driving and elevates Intelligent Drive to the next level. Active Distance Assist DISTRONIC and Active Steer Assist now provide even more comfortable support, helping the driver to keep a safe distance and to steer. The speed is now adjusted automatically ahead of curves or junctions.